I want you to know I feel your pain — I really do! Maybe we should just do away with the title of ‘mother’ and embrace what we currently are: teething survivalists. We knew when we signed up for this thing called ‘parenting’ it wasn’t going to be all rainbows and roses, but what we didn’t know is how a teething baby can drive you to the brink. For me, the brink manifests as an eye twitch. It comes and goes, but when my tiny one is crying out in irrepressible tooth pain, I can feel that twitching — all day long! Do you want to know what my first mistake was? Consulting Dr. Google. Don’t do it my friend. He is a quirky fellow and more often than not, his wayward advice has sent my tender mama heart spinning into a panic that may have merited late night phone calls to the hospital 24 hour hotline. Teething — the struggle is real, altering an entire household in its path. Schedules – gone. Even wardrobe changes. I recommend dark earth-tones, they hide drool and poo while simultaneously creating a slimming effect. Then there are the accessories for a teething mama! Now I am a big fan of bling-bling, but never in my life did I plan on plunking down hard earned moola for jewelry praised for being: BPA free, organic, food-grade silicone and (most importantly!) mom-approved. Why didn’t we think of chewable beads? I’m just glad I’m not the only one wearing something looking like it was re-purposed from a spatula. Are you sleeping at night? Great, me neither. I can’t even tell you how many times I’ve reheated the same cup of coffee only to forget about it. Oh, and then there is the teething gel, which did a whole lot of nothing for my baby, along with the many other teething-toys he’d rather not chomp on. Apparently he prefers to nurse and treat his mama like a juicy piece of Dubble Bubble. 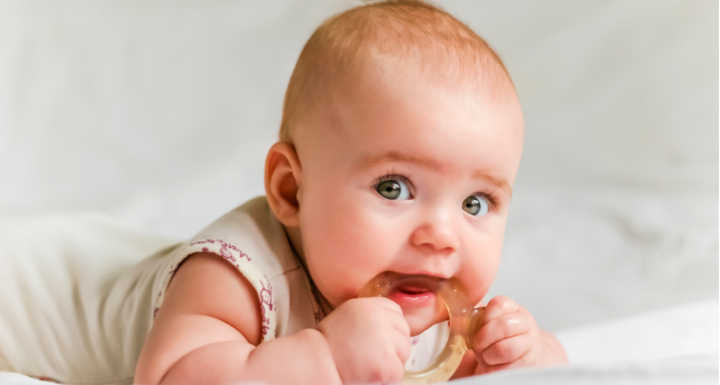 The truth is, beyond Baltic Amber, homeopathy, Advil, essential oils and whatever other tried-and-true methods are your ‘thing’ — teething is just plain hard! Like most challenging phases of babyhood, you can’t rush the process. So, weary mama, hold tight to your little peanut and when the days are long and you’re ready to throw the towel in, just remember you are not alone. I know how in those desperate moments you wouldn’t trade anything for being a mom, and yet in the same breath it feels like you would trade anything just to take a nap. Keep going, mama, you got this! When we catch our children laughing and see those precious, toothy grins, we’ll know we are privileged to be there through it all. Dip a clean washcloth in cold water or breast milk and let baby chew away. The chill and pressure help ease the aching. Gently rub your baby’s gums with a clean finger to soothe sore gums, or try a temple massage, which can be a calming distraction and ease the pain radiating from baby’s mouth. For example, try BPA-free teethers like the Nuk® Soothasaurus® or Infants’ Advil Drops for safe relief of teething pain up to eight hours. Teething babies drool – a lot. Keep washcloths on hand and remove drool frequently from your child’s chin to avoid irritation or a rash. You can put a little petroleum jelly on your baby’s chin to protect the sensitive skin.